Our laser heating apparatus (Fig. 1) combines conventional one sided laser heating with a Raman system (two-side heating is an option  not shown in Fig. 1). A Mitutoyo near IR 20x long-working distance lens is employed for the collection of Raman spectra in the backscattering geometry and for focusing of the heating IR radiation on the sample using the same optical path. A continuous-wave 60 W Nd:YAG laser is used as the heating source. In order to match the entrance pupil of the objective lens and to provide more uniform temperature distribution at the sample, we use a custom-made beam condenser. The YAG laser radiation is injected into the Raman system using a polarizing beam-splitter cube and is focused to a 20-30 μm spot. The heating laser power is increased in steps (by rotating a λ/2 wave plate coupled to a polarization cube). The Raman part of our confocal Raman system has been described in detail . 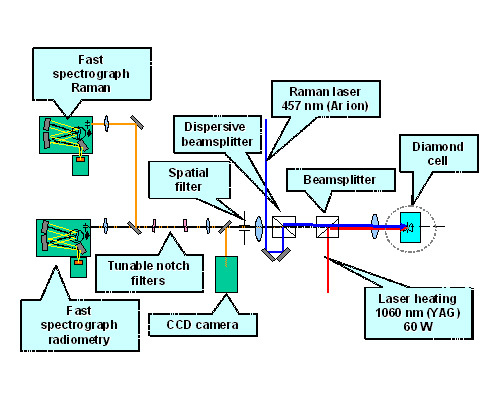 We used the 458 nm line of a 300 mW Ar ion laser to excite the Raman spectra. The Ar ion laser radiation is injected into the Raman system using a beamsplitter made of a Kaiser Optics laser bandpass filter. The scattered/emitted by sample radiation was analyzed by two dedicated single-stage grating spectrographs: Jobin Yvon HR460 for Raman measurements and Kaiser Optics Holospec  for thermal radiometry. We determine the temperature of the sample in the LHDAC by measuring thermal emission spectra over a wide, continuous spectral region. The Planck radiation function is then fitted to the measured spectra. The radiometry method gives reliable results at temperatures above approximately 1000 K, because at lower temperature the signal is too weak to provide adequate statistics. We also estimate temperature by analyzing the relative intensities of the Stokes and Anti-Stokes Raman peaks and also by measuring the relative intensity of hot vibrons band with respect to the fundamental (in case of N2, see below). This technique is based on an intrinsic property of the studied system, so it is presumably more accurate. The drawback of this method is a high uncertainty in the case of a very weak anti-Stokes signal, and also in case when the temperature is large compared to the energy of the Raman transition being used. Literature. Goncharov, A. F., V. V. Struzhkin, R. J. Hemley, H. K. Mao, Z. Liu. In Science and Technology of High Pressure, edited by M. H. Manghnani, W. J. Nellis, and M. F. Nicol (Universities Press, Hyderabad, India, 2000), pp. 95-99.